Grind walnuts and sf seeds in food processor until they are in very small uniform pieces (cous cous-like consistency) – transfer to a large bowl. Process zucchini or skinned apple in Food processor until they are in very small uniform pieces. Add to bowl. Add ground flax, hemp and salt. Mix well. Add enough water (1/2 – 1 cup) to make a spreadable dough. 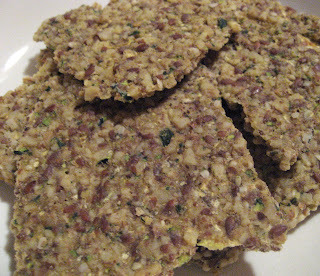 Divide mixture in half and spread each on a non-stick dehydrator sheet using offset spatula. Dehydrate 115 degrees for 2 – 3 hours Flip onto mesh dehydrator sheets and dehydrate at 110 degreesF another 18-24 hours. Break in to chips or score them halfway through dehydrating (after flipping) onto mesh sheet. Serve with Rawfully Tempting Sunflower Seed Pate and garnish with red onion and avocado. DELICIOUS!!!!! This oil has a delightfully nutty, buttery flavor. We think you’ll agree that it’s the best tasting flax oil. Rich in Omega-3 and Omega-6. Flax lignans are phytonutrients found in unrefined grains, legumes, certain vegetables and seeds. Flax is the richest source of lignans, providing more lignans than most other plant sources. Flax lignan is one of the hottest natural health ingredients in the market place. Flax has been valued for centuries for its good flavor and nutritional properties. A sonata with with high notes of floral and fruit. Lehua Honey’s rich, slightly floral taste and silky texture complement, but don’t overwhelm, other flavors and ingredients, making it one of the most versatile of honeys in the world. Lehua Honey is becoming one of the rarest on Earth. It is recognized for its unique quality, taste and connection to the islands of Hawaii. The Lehua is the official flower of Hawaii. It is sad that the Ohia Lehua tree is facing the threat of extinction. Our Ohia Lehua Honey is gathered by a family devoted to beekeeping. Hawthorn honey is light in both color and flavor with tropical, fruity highlights that reflect the fragrance of the hawthorn blossoms. We are pleased to offer you Boreal Dulse Flakes (Palmaria Palmata). The dulse is harvested by Grettir Hreinsson, a live food aficionado, in the pristine waters of a remote part of Iceland. Dehydrated below 83F. (Life Policy Shopper) When it comes to heart conditions, there are variety of different signs and symptoms your should be on the lookout for. Additionally, there are numerous risk factors that go into heart conditions, as well as a number of distinct types of heart problems you could be dealing with. We’ll break down a few important early signs you should watch for, but first, let’s get a few terms out of the way to help you have a better understanding of what to watch for. Artery Blockage: the buildup of plaque (fatty deposits) overtime that results in a hardening of the inner walls of your arteries and can lead to blockages in arteries. Heart Attack: a sudden, and sometimes fatal occurrence of coronary distress that typically results in the death of part of the heart muscle. This occurs when the blood flow that brings oxygen to the heart muscle is severely reduced or cut off completely. (Dentaly) Most people really hate going to the dentist. The sound of the drills sends chills down your spine, and the thought of sitting in that chair makes you shudder. However, going to the dentist is one of those things you can’t avoid, right? And if you do, everyone will know (see: halitosis, rotting teeth, etc.). So if you have an irrational fear of the dentist, you just have to grin and bear it. Or do you? Maybe you can’t avoid the dentist all together, but there are things you can do to minimize dental visits. 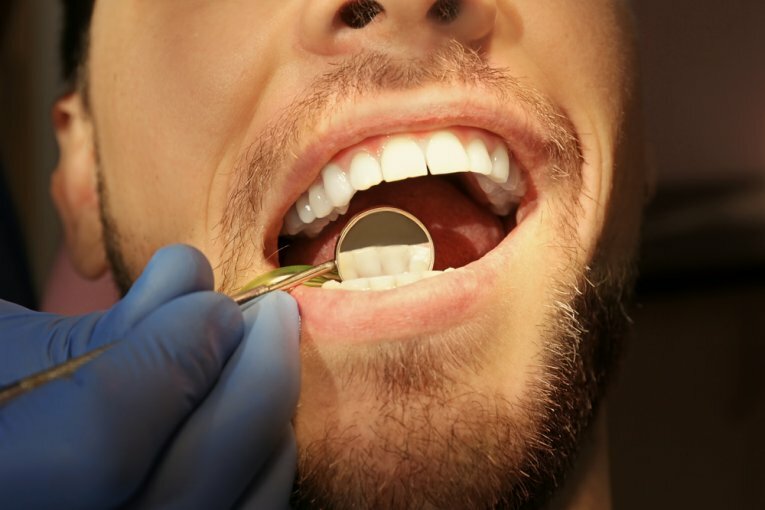 There are new studies coming out that suggest that there are natural ways to take care of your teeth. Some of these studies have said that even things as simple as changes to your diet may be able to heal cavities and reverse tooth decay. Is this too good to be true, or can you avoid the dentist using some natural remedies at home?